This is very close to a salad, but it is so bright and fresh that it works much better as an accompaniment for a nice juicy skirt steak, a fish taco, or chicken. The organic mango was the best of the season - sweet and juicy perfectly ripe. It pairs beautifully with the fresh local corn, although frozen would work just as well. I had the spicy mango chutney from when I made that lovely Indian Lamb Chops with Curried Cauliflower. Come to think of it, this would go exceptionally well with that dish as well. 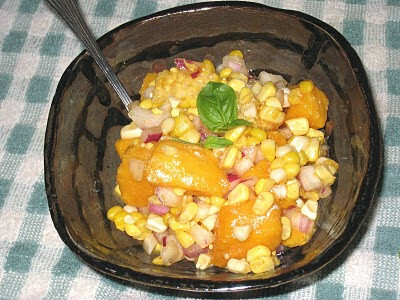 Place mango, corn and onion in a medium-size bowl. In a small bowl, combine the mustard, mango chutney, fish sauce, and apple cider. Whisk together until well incorporated. While whisking, slowly add oil. Season to taste. Pour the sauce over the mango and corn mixture and stir gently until it is well mixed.